What’s the powder coating process? What’s the hot dip galvanizing process? Why doesn’t Throttle Down Kustoms build welded frames? How do you make your mandrel bent frames? 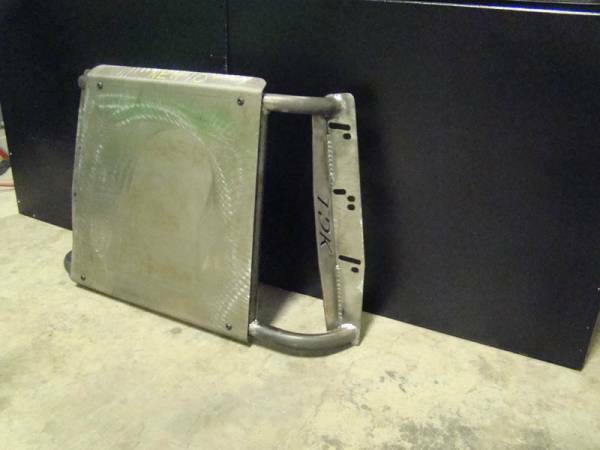 Do you offer custom mandrel-bent Jeep frames? How does a shackle reversal benefit me? What bushings do I need for the Shackle Reversal Kit? What is the warranty on the bumper powder coating? Does installing a new bumper affect the airbag functionality? Does Throttle Down Kustoms offer Sponsorships? How long does it take for a product to arrive at my door? What happens if I need to return or exchange a product? Do I need to have an account to order a product? How do replacement products affect my vehicle’s warranty? How can I be sure the product I need will fit my vehicle? If you select during the order process or at other times when you submit personally identifiable information, the information you provide may be used by Throttle Down Kustoms to create and deliver to you our newsletters, surveys or other communications containing product information. If you prefer not to receive such Communications, please do not select the ‘Please inform me option’. If you do select this option and later decide that you would no longer like to receive these communications, please use the features made available to you. If you have requested a Throttle Down Kustoms brochure, all information is kept completely confidential and is not shared with any third parties. We may, on occasion, send you an updated catalog or brochure. If you do not wish to receive any mail from Throttle Down Kustoms, please contact us via email at . Include your name and mailing address and email address. You will be removed from any future mailings. If you have elected to provide us with your contact information, e.g., by registering at the Site, emailing our Customer Service department or placing an order, we may provide you with service related announcements concerning the Site or contact you regarding your customer service requests or your order. For example, all registered users will receive an email to confirm their order. These types of communications are necessary to serve you, respond to your concerns and to provide the high level of customer service that Throttle Down Kustoms offers its customers. We will never provide your personally identifiable information to third parties for their use in marketing their products or services to you without your consent. Throttle Down Kustoms takes great pride in having you as a customer and we will ensure your privacy as a customer. 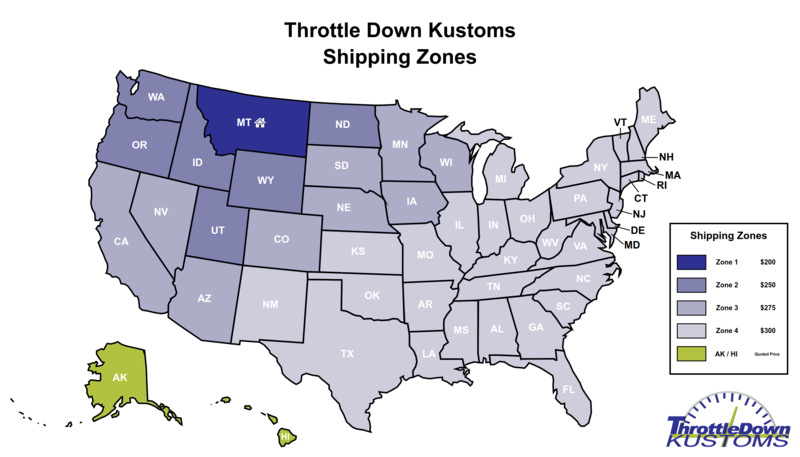 Throttle Down Kustoms does not sell or exchange names or any other information about our customers with third parties. www.throttledownkustoms.com does recognize your ISP (internet service provider), however, we cannot identify you as an individual. If you make an on-line purchase we do collect information (such as sales statistics and traffic patterns) to help improve your shopping experience. We keep all information confidential. Throttle Down Kustoms seeks to protect the security of your personal information both online and offline. All credit card transactions are secure. Every on-line order is encrypted and sent through a secure server, using SSL technology to prevent information from being intercepted. If you are a registered member at Throttle Down Kustoms, you can change your personal information at any time by updating your information at check-out. We welcome your comments and questions about privacy. Please send email to jeremy@throttledownkustoms.com. We are confident that your visit to Throttle Down Kustoms is secure and safe. However, you may choose to call us directly to place your order over the telephone. Please call Customer Service toll free at 406 374 2285. Q: What’s the powder coating process? After we sandblast the metal and clean it with iron phosphate, we spray powder coating on it. This results in a consistently stronger, tougher, and better finish. This website has a more detailed outline of the process (including pictures) if you’re interested in reading more about it. Q: What’s the hot dip galvanizing process? We dip fabricated steel into a vat that contains molten zinc to create a reaction that results in a tightly-bonded alloy coating. This process protects the steel from corrosion. The American Galvanizers Association has tons of information about the process if you’d like to read more about it. Q: Why doesn’t Throttle Down Kustoms build welded frames? When Throttle Down Kustoms owner Jeremy started prototyping his Jeep frames, his first approach was cutting and welding the metal. He noticed how sloppy and patched together the welded frame made the vehicle appear. It wasn’t up to his standards and definitely not good enough for anyone investing their hard earned dollars into a Jeep rebuild. He quickly found a better solution: mandrel bent frames. Q: How do you make your mandrel bent frames? We invested hundreds of thousands of dollars into mandrel bending equipment. We also invested hundreds of hours into training and testing to build the best frames on the market. We consider this a worthy investment because it allows us to do extreme custom work and to control the quality of our frames. It’s important that we bend our rails in house because having them pre-bent by a large steel plant does not guarantee top-notch quality. Our frames are assembled in a jig to guarantee precise measurements, and then our certified and experienced welders welds them together. All of our brackets are carefully built with appearance and factory specifications as our top priorities. All of our frames are completely cleaned and prepped before being shipped or galvanized. Q: Do you offer custom mandrel-bent Jeep frames? If you’ve ever thought of putting a TJ suspension on a CJ, look no further. Our new Hybrid Jeep Frame Basic frames are just what you need. They are constructed from 3/16” mandrel bent tubing. 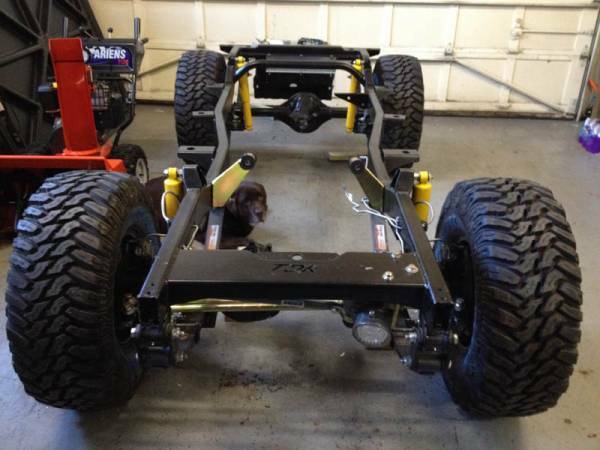 Feel free to call or email us if you’d like us to build you a custom Jeep frame. Q: How does a shackle reversal benefit me? A shackle reversal creates a smoother ride. The factory shackles on your Jeep are positioned in front of the front spring. When you hit a bump, your axle automatically jerks back, but the shackles force it to jerk forward. This results in a rougher and bumpier ride. When we reverse your shackles, we put them behind the front spring, which will allow the axle to jerk back like it’s intended to. Q: What bushings do I need for the shackle reversal kit? We offer shackle reversal kits for CJ springs and YJ springs. 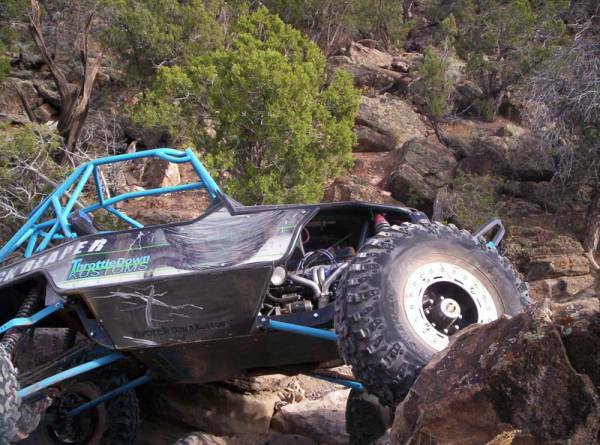 Both options require YJ frame shackle bushings on the front spring and the rear spring. Also, we recommend buying 4.5” long shackles along with our SR Kit. Q: What is the warranty on the bumper powder coating? We will warranty the powder coating for a period of 120 days from the ship date. After the 120 day period, we won’t warranty the finish of our products due to normal wear and tear and exposure to natural elements. Q: Does installing a new bumper affect the airbag functionality? No, TDK bumpers do not affect airbag functionality. Sensors are located either in the front of the vehicle, in the passenger area, or in the engine compartment. Different types of sensors measure wheel speed, seat occupancy, brake pressure, and impact. Other vehicle status indicators are also monitored by the airbag control unit, which analyzes the data and can relay safety features like seat belt lock and auto door locks in addition to airbag deployment. 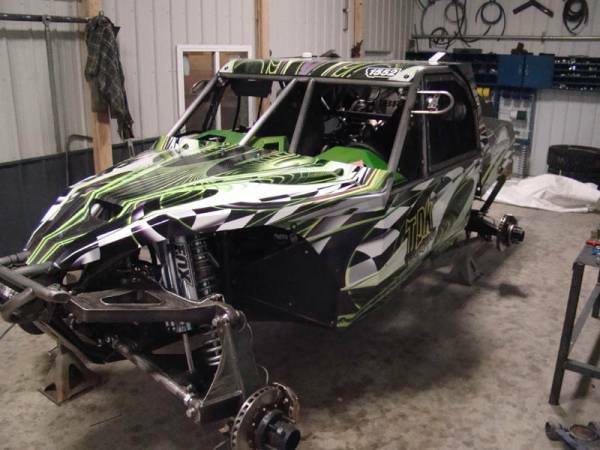 Q: Does Throttle Down Kustoms offer Sponsorships? At this time, we don’t offer any type of sponsorship. Q: What happens if you send me the wrong product? Contact us and we’ll get on it right away. We will cover all return shipping charges as well as send you the correct product as soon as possible. Q: What happens if I order the wrong product? Hey, mistakes happen! You’re more than welcome to return the product to us within 15 days of receiving it. Check out our Return Policy to find out how you can return or exchange one of our products. Q: How long does it take for a product to arrive at my door? We offer rush shipping for some products, such as apparel. But if you order a custom item like one of our bumpers, shipping will take 2-4 weeks. Q: What happens if I need to return or exchange a product? First, ensure that it’s been less than 15 days since you received your order. If so, you can follow the easy steps in our Return Policy to return or exchange your order. Q: What if the product is broken or damaged during shipping? Yes, we do. You’ll need to email your complete address first for a shipping cost estimate. For certain orders, yes. We can’t offer expedited shipping for our oversized products, such as our bumpers and frames, though. When you place an order on our website, you’ll be making a secure 128bit SSL encrypted payment. We also use PCI compliant processes to ensure that your credit card information is as safe as possible. Call us right away and we’ll try to cancel your order before it’s processed. If the order has already been processed, you may be assessed a cancellation fee. Q: Do I need to have an account to order a product? No, you don’t need to. You can check out as a guest. We recommend having one, though, so you can easily track your past and present orders. Of course! We offer a lifetime warranty on all of our products. Our Warranty page has all the information you need. Q: How do replacement products affect my vehicle’s warranty? Q: How can I be sure the product I need will fit my vehicle? 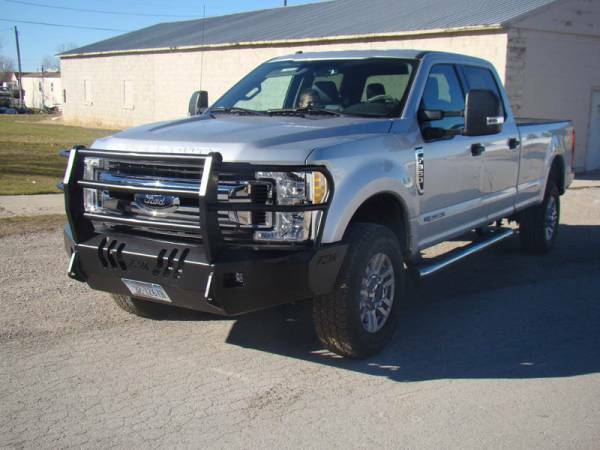 Our website allows you to search bumpers, frames, and other parts based on your exact year, make, and model. But if you want to be 100% sure you’re ordering the right part for your vehicle, feel free to give us a call. We’ll gladly help you out! Give us a call, or you can email the owner, Jeremy. He’ll get back to you as soon as he can. Monday through Friday, between 7:00 AM and 5:00 PM MST. Sales tax depends on your state or country of residency. Taxes will be calculated at checkout.